This blogletter is mainly Jeffrey Feint’s experiences. It is really enlightening when people share their thoughts so freely. Although I have responded to some of them individually, it would be really useful if a number of you could also express your opinions about what he has said. I have always found that until you are getting contradictory advice, you are not making much progress. Keep up the good work! Once again I am thrilled to send you a blogletter filled with reader’s comments, starting with reaction to an earlier one. So stock won’t eat Totara huh? Was just looking at protecting five young trees I have so I could put sheep amongst them – do I need to? Only way to find out is to be wrong. Might hedge my bets and protect some of them and leave a sacrificial experiment. I like your approach to the comments in the blogletter about stock not eating totara. I wish everyone would test things out for themselves rather than taking the word of “experts” at face value. “Poke it and see” should be a way of life for tree croppers. Please let me know if sheep eat totaras for real. I have often commented that we have learnt by trial and error, with more error than trial! This has led me to develop my philosophy of walnut management viz. We have been avoiding Herbicides where possible [although we are not organic], over the last two harvests we have been “ blessed “ with good summer – autumn rains and have battled excess grass growth which has necessitated mowing 2 – 3 times during harvesting, which in itself causes damage to nuts lying on the ground. I should add that we now harvest around 3.2 tonnes per year of 4 different cultivars plus wild nuts each harvest. This year our harvest went from around mid April for about 5 weeks. – Meyric 1199 are by far our best nut but the shells we produce in Wanaka seem incredibly fragile, and I have almost reached the stage of abandoning any sort of machine harvesting because I estimate we lose up to 20 % of nuts due to breakage of the shells even when something as light as a quad bike with wide wheels runs over them. – Franquette are often large and thick shelled, sometimes they look externally to be a good nut but on cracking them they have poorly developed kernels, especially if the nut looks “ moist “ externally. They are also incredibly hard to dry and several years ago I lost several hundred kgs when although I thought that they were well dried they developed a grey mould both inside and outside the shell whilst in onion bags! I think that one also has to realize that one does not have a single run with a harvester or whatever one uses for harvesting, but that during a harvest one has to make several runs with the harvester, even if a tree shaker is used. Our nut yields seem to have plateaued at a little over 3 tonnes with our 450 or so trees being between 13 – 17 years old, but I calculate that we should be closer to 10 tonnes or more – I am really at some loss to work out how to increase this yield and would welcome help. – Blenheim[300. I think they may also be called Stan and they came from the original NZWIG Trial.] a good nut which are easier to process because they are round and do not jam so easily in equipment. Quite a nice nut to taste, relatively early fruiting] – Wild Nuts we originally planted about 80 wild trees which I regret because some produce quite good nuts but others are small and do not taste very good. I think one must resist the urge to build a small machine that will just handle one’s immediate requirements, but instead should try and anticipate future requirements and build this into the system. I agree with the comment that one must try and reduce handling between different processing tasks, and to this end we are slowly building a collection of Conveyor Belts. The nuts are then emptied into a large wire cage that is placed in an insulated shipping container into which heated air is circulated. I find that with 2-300 kgs of nuts it takes about 3 days to dry through to the centre of the cage. My heat source is a diesel heater and this year I was horrified to find that I was going through about $300 of diesel in 10 days – I am considering the possibility of adding a solar hot air system to this. 60 kms away. It seemed to me that many French orchards were quite small but you might have many grouped together in one region, so that the individuals could form a cooperative and buy a large harvester and processing setup to be shared. Interestingly when I was getting quotes from experts before planting our orchards about ultimate revenue, the costs of processing were never mentioned. Experience has proved that these costs are quite large! Your comments prompt some questions in my mind. – We have also found bigger nuts need more care in drying to make sure that they are properly dry. In the latest WIG magazine “Health in a Shell”, there was an article about drying walnuts. I found it a bit difficult to understand, but one thing I took from it is that we need to be aware that drying is quite a complicated process, both within the stack of nuts and within the nut itself. This seems to get worse in my experience the bigger the nut is. So how are you determining when your nuts are dry? – what is your tree spacing? The mistake most people make when planting seedlings is to put them too far apart, without realising that some will not make the grade. I personally plan on removing three quarters of what I plant. But even then it can be difficult to decide which ones to cut out because there are so many factors that make a good walnut tree, like tree vigour, nut quality, cropping yield, cropping consistency, and so on. Thanks for your comments. I am sure other growers will find them as helpful as I have. At the moment I am in Australia doing locums in Darwin and Mount Isa so I have not had chance to see the “Health in a Shell ”on drying. I initially tried using forced air for drying since I thought that the Wanaka air would be low humidity and good for drying, but I found that this did not give enough drying, and have now used a diesel unit. I am ashamed to say that I have not used any comparison of weighing nuts before and after drying, but I do go on how brittle the inner septum is [I shall try next season to assess weights]. Incidentally I have noticed that after initial drying I have stored the nuts in 20 kg onion bags and after storage for a month or so they lose a further 4 kg or so in weight, which I guess means that we could dry a bit harder the first time . Our original plantings were at 10 metre spacings and our Meyrics are now actually meeting in the middle of the rows, and we will be looking at heavy pruning soon. Although we have had our share of tree deaths I have not actively removed any trees. Incidentally I think that we have lost several trees with phytophthora with mature trees dying over several years – I guess that this means that I can never plant another tree in that site since the fungus is endemic in the ground? So far a mechanical grader for size is on my list of things to make but hopefully I will get onto it this winter. I think that it is important when selling nuts in shell to have larger relatively uniform nuts especially since smaller ones are much harder to crack for their kernels. Before I bag the nuts into onion bags I load them into an elevated Hopper and then they fall onto a flatter surface, so that I can remove any blighted or broken or very small nuts, they then fall through a chute into the onion bags. I suspect if I had more confidence in our ability to only process “good” nuts then we could probably eliminate this final sorting. One of the people who buys our nuts wants the in-shell nuts in 500 gm bags – I have partially “ mechanized” this process with an Elevated Hopper into which the nuts are placed, they then fall onto a Electronic Weighing Scales, and then are emptied into another Chute which has the 500 gm Netlon Bag over the lower end. However I am having some troubles with getting the scales to retain their accuracy once the nuts fall onto them. Quite frankly bagging the nuts is an absolute “pain in the arse”, and I estimate it takes me about 20 seconds each bag, which mounts up after about 500 bags!! I did mention that walnuts have this infuriating ability to jam large diameter pipes and conveyor belts, and I bought a Vibrating Unit from my friendly machinery recycling firm – sadly I have yet to install it and I hope that when I do it might stop these “log jams”. I would be interested to hear of other’s experiences with constructing processing machinery. I have been helped by various people to make new machinery, but I would guess that probably we frequently face failures or problems before we achieve success. Now something a bit different to expand our horizons. I often hear about walnut oil, and what wonderful stuff it is, but does anyone know how it is produced? Specifically, are the nuts crushed in shell, or do they use a particular grade of walnut kernel? My friend Harry Austin made his own olive press, as he describes below, so that might be a good place to start. 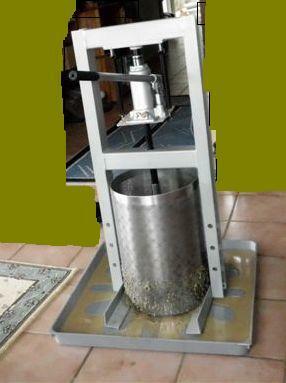 Here are the pictures of my Oil press, I did not want to spend NZ$3000 on a commercial one. So it is made up with a NZ$189 SCA 6000KG hydraulic shop press from Supercheap Auto’s. I have since modified it by having an extension to the legs welded on about 6 inches. I found the angle iron did not take the strain. The basket was a bit of worn out screen from work bought at scrap value. A mate got it cut out, rolled and welded up as you see in the picture at a local engineering firm. The hole size in the screen plate was 1.5mm diameter. I went to a stainless fabrication shop and purchased some stainless gauze i.e. sieve material. I have cut it out to suit and it fits in very well. I purchased a hand mincer from a second hand shop and used it to mince the olives after I had done the first cold press. I found that I had to use a lot of energy to mince then using small holes, so I changed the plate and used big holes and after completing it I repeated the process using the medium holes. I have asked a work college who is an ex butcher if he knows where I could get a butchers mincer from and he said he would look out for one for me. There are 2 sizes and I want the small size. The Tray under the press is a hot water cylinder tray bought from local plumbers merchants, Shapleys. It was half the price of the Bunnings warehouse one. Pays to shop around. I have now got about 70 olive trees of different varieties, next year I will make sure I get the olives picked in time and not let the birds eat most of them. We have pickled several containers ( 4 litre pails about 1/2 to 3/4 full ). All my pressings have been cold pressed. I believe commercially they stew up the olives to 80 centigrade and press them again. I have been finding the high omega-3 oil content of walnuts a great selling point recently, and have been feeling a bit cocky about stumbling into an industry with health benefits I never knew about. Then I heard about Camelina and thought I had better keep an eye on the competition. You may have heard of the increasing interest in biofuels . One of the most promising ones is Camelina sativa, in the cabbage family, being grown on a huge scale. According to Wikipedia “The US State of Montana has recently been growing more and more camelina for its potential as a biofuel and bio-lubricant.” It is obviously produced in huge quantities, especially now that the aviation industry is showing interest in it as a low pollutant jet fuel. But “Camelina has also been approved as a cattle feed. Camelina seed ranges from 37 to 41% oil content and this oil is high in omega-3 fatty acids. Camelina meal is the by-product of camelina when the oil has been extracted. Camelina meal has a significant crude protein content. I know many of us take fish pills for high cholesterol, and I have heard of a doctor prescribing walnuts for the same purpose, but will people eat Camelina as well? Stranger things have happened. Could it become such a prevalent source of omega-3 that nobody needs it in walnuts?